Right now you can help Blissoma grow something organic and good. How, you ask? You might be sitting there in your pajamas, or in your latest sustainable fashion or thrift store score, or maybe a suit, or even your skivvies. Maybe you don't like to get dirty. Maybe you live in the middle of a concrete jungle with not a shovel in sight. No worries, we'll do the digging. If you've been with us since last year you might have seen that Blissoma is spearheading the start of a community garden on the 1400 block of Bremen Ave. in St. Louis, MO. The lot is just across the alley from our studio building. When we bought the building we had dreams of gardens, but were pigeonholed into purchasing a building that had minimal yard and building all around. Fate took care of that for us when the city-owned row houses across the alley from us were demolished. Photos of the buildings and their demolition are included in our initial garden post that you can read to catch up. Over the last 1 1/2 years we have broken ground on more than 40'x40' of this massive lot. It's not easy work. As a former building site we have bricks and clay to contend with. To generate a safe and fertile bed for our plants we have hauled in more than 8 city dump trucks worth of compost, manure, and new soil materials. With them we have built what is essentially a giant raised bed for the plants. This year we hope to triple the amount of cultivated land. We want to get big and we want to get big fast. To save the land from developers in future years we need to put down our footprint large and in charge. 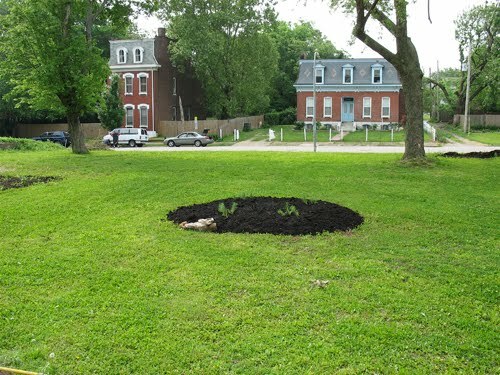 We hope to show our alderman and everyone in the area how a garden can change their quality of life. It's a big lot - the size of 4 row houses. Here you can see the center of the lot where we put in a circular flower bed for last summer. 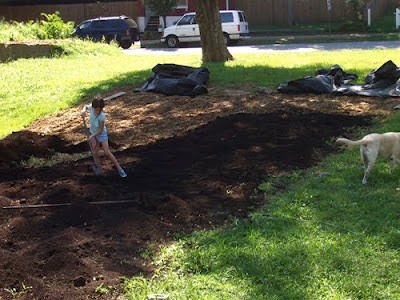 We are gearing up to try to cultivate most of the lot - at least as much as we can get to this year. 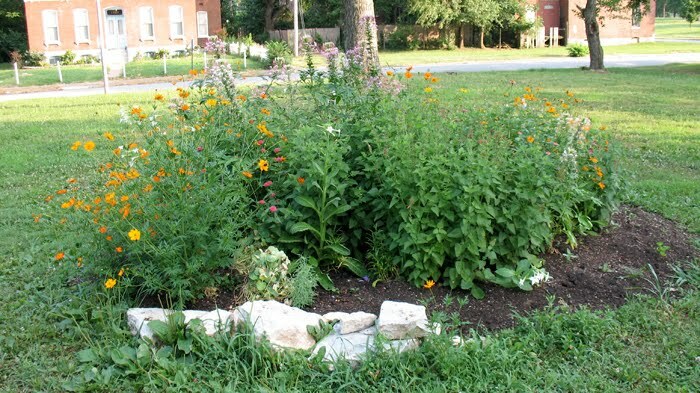 It's rather magical turning weeds and bricks into flowers and food. Our hope is that the plot can be a teaching tool for local residents and a source of clean food, healthy activity, fun, and neighborhood beauty in a place that sorely needs it. We're not alone here in St. Louis doing this growing thing. In fact some of the folks that inspire us most are working just over in Ferguson, MO. 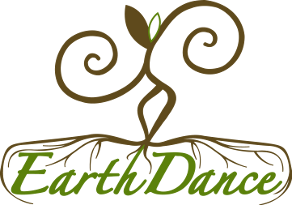 Earthdance is a nonprofit founded by my friend Molly Rockamann. Molly had a big vision to save a 100+ year old organic farm in Ferguson from imminent development. The farm wasn't being used and the family owner was in her 90s. No one was cultivating the land and it broke her heart to think of such clean, fertile soil being graded for just another housing development. Molly stepped in and created a nonprofit that would work the land and teach organic farming skills to others. 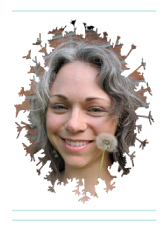 She's our inspiration an d the agricultural instigator for dozens of "Farmies" now. Each year a new group of apprentices heads to the farm to be taught how to plant and maintain crops sustainably. Those Farmies then head out into the wide world to spread organic skills wherever they go. Approximately 30 Farmies are working Earthdance this year. They're bringing sustainable produce to farmers markets, a small CSA, and local stores and eateries. More importantly they're "growing" the future of organic farming. Molly brings people together to work and to play. With Earthdance the phrase FARMS stands for Food, Art, Relationships and Music - Sustainably. Life revolves around their plants. Earthdance folks love a good song and some good greens - and sometimes songs about greens! 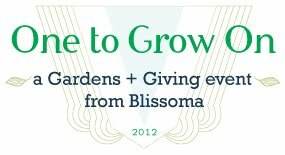 To support Earthdance and our community garden we're hosting One to Grow On now through 5/31/12. Every purchase on our home website http://www.iriestar.com will contribute to One to Grow On. This means that 20% of our gross website sales for more than a month and a half will be going to directly support the expansion of organic farming in our local community. You'll save 10% off your order total for yourself as long as your order totals more than $10. No coupon code is needed. In fact you don't need to do anything special to contribute. Just show up, buy what you love from us, and your purchase contributes to the giving fund. All products on our website are included - even gift certificates. New customers and returning customers all pitch into the pot so tell your friends. Their purchase helps too. For promotion we are partnering with our wonderful friends at Eco-Emi, the original green sample box program. We'll announce more fun with them in coming days. Incidentally Eco-Emi is another St. Louis based eco-friendly operation, so we've got triple the environmental and organic goodness all packed into one great event.